Time to ring-fence "Lights On Outsourcing" and focus on "Business Transformation Services"
1) The "Lights On" camp. Let's make no bones about it, we just want to drive out expense without any costly disasters occurring. We don't see any strategic value in these processes, and as long as it's cheaper to have someone else run them and they don't impede our business, then we're happy with that outcome. We only want a small governance team that causes us few headaches and keeps the lights on. We don't want to hear about problems, or additional investment requirements. We'll revisit the engagement when the renewal is up to see if we squeeze a few more bucks out of the supplier. If the whole things messes up, the chances are we'll all be long gone, in any case, and our successors can deal with it. As long as our shareholders are happy with the immediate returns, that's the main thing. 2) The "Efficiency" camp. We don't see a hell of a lot of competitive differentiation in these processes, but we do recognize that there's more than an initial 30% we can lop off the budget if we're smart about this. So let's plan for phased process improvement and additional layers of processes to externalize in the future. We'll build a governance team of Six-Sigma blackbelts to oversee a 5 year cost-efficiency plan. Maybe we'll take 20% savings now and reinvest 10% in inhouse skills and some consulting support to ensure further efficiency gains will be made down the road. 3) The "Transform" camp. We've learned that simply moving work offshore is only a short-term cost reduction measure - these costs will eventually reappear if we only perform an onshore-to-offshore staff exchange. We're simply not going to "kick the can down the road" for someone else to deal with them. We've learned that failing to invest in process improvement, once we've moved processes into either into our own shared service center, or into the hands of a third-party provider, will result in the stagnation of that business function. We've also learned that outsourcing as much work as some providers and outsourcing advisors tell us we can, isn't always going to provide the answer - it's outsourcing those processes that make sense, and working with the provider to inject their ideas and capabilities into improving our overall business function. And our providers need to understand our institutional processes and issues (no matter how messed up they may be) - or, at least, provide us with account managers who have that capability. They need to understand how to help us improve our business outcomes, based on the combination of our inhouse teams, our shared services and what we have externalized to third parties. Predominant model = Outsourcing. Around two-thirds are focused heavily on keeping costs on plan and ensuring efficient performance, and a good 50-60% of them place importance on standardizing process, meeting compliance goals and keeping the quality of service to the organization high. However, less than half place importance on transformation (38%), globalizing processes (45%) and improving finance capability (43%). This strongly implies that most of those firms operating their finance in a predominantly outsourced model are in the "Lights On" and "Efficiency" camps. Predominant model = Shared Services or Hybrid Shared Services & Outsourcing. The differences between these models and the outsource-only model are striking. Firstly, these organizations are a lot more purposeful across all business objectives, which strongly suggested they feel in much more control over the finance functions and are striving to make both efficiency and transformative improvements. 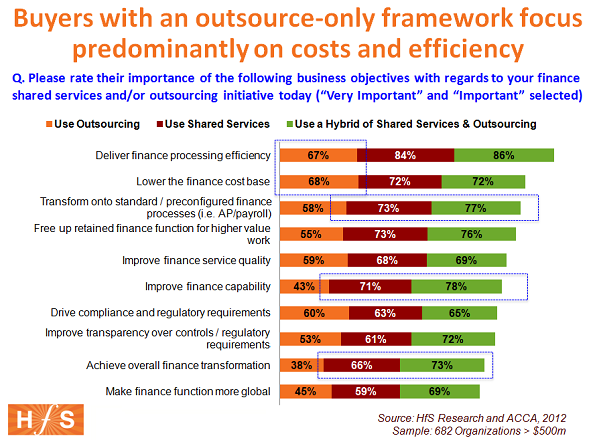 Secondly, it's those organizations with a balance between Shared Services and Outsourcing, which have the most pronounced determination to achieve overall finance transformation (73%), improve their finance capability (78%) and globalizing finance processes (69%). Not only that, but they are also more focused than anyone with achieving efficiency (86%), standardizing processes (77%) and keeping costs low (72%). It's strikingly clear that it's the Hybrid organizations that are achieving the balance between being efficient, but also are viewing their finance function in a much more strategic light - hence these organizations appear to cross over both the "Efficiency" and "Transform" camps. It's almost as if many organizations in the outsource-only category are giving up the ghost on making innovations or strategic improvements to their finance. True, many orgs may be new to outsourcing and are merely focused on getting through the day, and also true, most outsourcing deals are (annoyingly) signed by senior executives who delegate the governance to operations teams with little clue as to what the business objective were, so only focus on meeting contractual metrics. It's as if their world has been frozen, and they have now become resigned to maintaining the status quo. This have some pretty serious ramifications to the outsourcing business - those buyers who only care about cost and basic risk mitigation (the "Lights On" guys) will probably never change (unless they get acquired by firms with more ambitious finance goals). So providers should give them what they want - reactive account managers who'll jump through hoops to keep labor costs down and hit those SLA green lights, for the sole purpose of making everyone look good (even though most of those SLAs were pretty pointless in the first place). Conversely, those organizations that have retained a good proportion of their shared services still hold out hope that they can find new ways of delivering value to their organizations, and they can leverage the capabilities of their providers to help them (read our earlier piece on this topic). Buyers must re-evaluate their provider mix. Decide which camp you are in and create the right environment to succeed. If you are a buyer and want more than "Lights On" outsourcing, then find a provider which has the domain and consultative capabilities to work with you. If you're stuck with a provider which simply doesn't have the skills and capabilities devoted to you that you need, then you have a serious problem and you need to find a way to either ring-fence them and find additional third-party talent, or get rid of them altogether. Providers must ring-fence their clients to allocate their talent appropriately. If you are a provider and want more clients in the "Efficiency" and "Transform" camps, ensure you have dedicated your higher caliber talent to supporting your existing clients in those camps, and they will form the base with which you'll win your next 10-20 deals. You'll always have a good portion of "Lights On" clients (you know who they are), so give then what they want and devote your higher caliber talent elsewhere. If clients want basic services at the lowest prices, then give then just that! However, it's high-time to segment the industry so we can all focus on delivering value, and not solely cost-cutting. Click here to read more findings from the ground-breaking HfS Research / ACCA Global "Sourcing Success in Finance Study" by clicking here. I think you might have missed a type of organization that tends to outsource -- the paranoid camp. Really good data - doesn't surprise me. You're correct that many clients become frozen after a deal is signed. The onus is on suppliers to ensure clients who want business transformation can have direction to get there, however, its impossible if they push hard for lowest cost at the same time! Great insight (as always). Data is revealing in that many companies focused heavily on outsourcing are struggling to set business objectives. My argument is why would objectives change because you outsource? Maybe many of those that choose to outsourcing in the first place had this "lights on" mentality to finance? Great segmentation and it's refreshing to see that a good portion of organizations still want a consultative approach to their partnerships. This certainly will help many providers decide on where they want to focus their efforts. I think Stephen C makes a good point above. In addition, I doubt there are many senior execs who would identify "lights on" as part of their strategy, when they do have business objectives succesfully embedded. Lights on is a tactical response to a business concern, not a strategic decision. So why all the pain for so little gain? I tend to find that in the majority of cases there is no conscious choice to become a 'lights-on' purchaser, but that this results from a lack of ambition/trust wrt third parties, or by a failure to correcly feed demand into 3rd party engagements/tenders. Whether by conscious decision out of the former, or by habit/culture from the latter, the customer will tend to underestimate the capabilities and potential of their providers. From a recent blog on this site I recognised that the big outsourcers had, to some extent, created this problem themselves by attempting to cover the outsourcing capability rather than specific business markets, and therefore failed to create a compelling image as having the in-depth, industry-vertical-specific knowledge to take on a transformational role. I still maintain that until they produce specialised daughter companies or similar offerings, they will come under massive pressure from niche providers for transformational business. It would make sense for these providers to partner with consulting capabilities who can guide the customer in translating their business strategy into demand and demonstrate how they can receive a lot more than simple lights-on. Thanks for the great blog on outsourcing. I own a Portland Oregon Market Research company. We provide high quality market research and phone surveys to companies in the Portland area and elsewhere. We work hard to make sure we're not just a "lights on" type of outsourcing company and can help clients get the service they truly need, not just good labor rates. Phil Thank you for this Great article ! To reduce cost of outsourced services , they end up selecting the provider who may not have capability to offer transformational services. 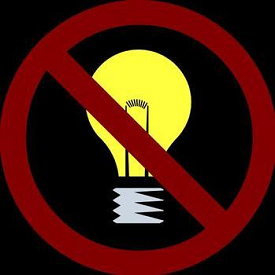 So they are stuck up with ‘ lights on” outsourcing during the tenure of the contract period. Many feel that only low value , labour intensive and repetitive work should be outsourced and there is little incentive to transform these processes. They feel that the outsourced processes have little impact on the overall business outcome and thus it may not be worthwhile to transform them. Transformation is hard work – the clients must work shoulder to shoulder with their vendor to bring in real transformation – it cannot be “outsourced “ to the BPO service provider . Thus , due to different business priorities , they avoid it None- the-less there is immense value to be captured in “ business transformation services “ as against “lights on outsourcing” . But most BPO customers leave lots of money on the table by not following that route for the reasons mentioned above.